Nowadays, one reads a lot about open source equivalents of proprietary software. Often these are described as poor substitutes for the real thing. However, some open source apps are starting seriously to outperform their proprietary counterparts. Mozilla Firefox is a classic example of this phenomenon. GNUCash is another. I was a Micro$oft Money version 2 user, then a Money 2001 user, first on Windows and then on Linux using WINE. But the fact that later versions of M$ Money use Micro$oft Internet Explorer as their engine scared me. You really don't want your accounts package connecting to the internet without your express permission, do you? Moreover, Internet Explorer is not exactly the most secure application on the planet, is it? Whilst M$ Money offers a lot of functionality, GNUCash is also packed with useful features. Indeed it is is one of the few qpplications where its "Tip of the Day" dialog really is worth reading. Genuine multi-currency system. This is handy if you run say Sterling and Euro bank accounts side-by-side. Manages investments much more logically and transparently than MS Money. Will safely and securely download current share prices and currency values. Data-file is a compressed XML file - so your financial information is not locked into a proprietary format or tied to the product of just one corporation. Also means your business finances are no longer locked into M$ Windows either! Originally developed for Linux, it can also be compiled for most other Unix or Unix-like operating systems, including FreeBSD, Solaris and Macintosh OSX. There is also a version for M$ Windows. Reports are output in standard HTML format. This means it is easy to email them to your accountant or to import into an OpenOffice (or MS Excel) spreadsheet - so you can lay it out exactly as the boxes appear on your Self Employed Tax Return. It is completely free. That is free as in beer and free as in freedom. All its updates are free. Updates are genuine improvements and enhancements, not just cosmetic tweaks designed to extract more money from the hapless punter! Its developers are open and honest with regard to the product's shortcomings. You can export all your M$ Money accounts as QIF files (albeit one-by-one) and they import perfectly into GNUCash - which is what I did. I have been using it since 2007 May and it is one of the best business decisions I ever made. It is very easy to set up a set of accounts that suits your particular business. And its generic nature means it can be customised to deal with whatever method of value-added or purchase tax exists in your particular country. 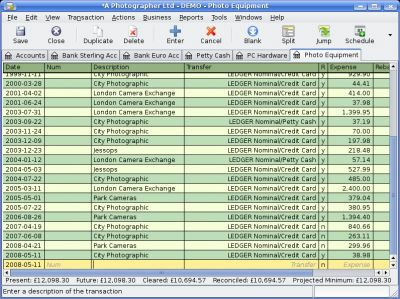 The sample screengrab below shows a fictitious set of accounts for a non-VAT registered UK-based professional photographer. Fictitious accounts for a professional photographer. Click to see full size.